General Staff released a video in which 25 Kurdistan Workers' Party (PKK) terrorists gave themselves up to the military in Nusaybin town, where counter-terror operations are still in progress. The terrorists were seen holding their hands up in surrender in the footage, issued a day after they were rounded up in a quarter where all buildings had been levelled during the operation. According to the footage, the terrorists left places they were hiding and surrendered in small groups after security forces encircled a troubled quarter in the ongoing “Hawk-7" campaign. 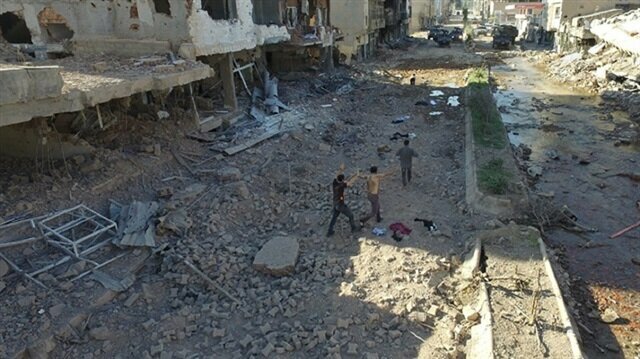 The campaign began in Nusaybin to remove PKK barricades, fill ditches dug by PKK, deactivate explosives used as booby-trap bombs, and ensure public order. General Staff released a video in which 25 Kurdistan Workers' Party (PKK) terrorists gave themselves up to the military in Nusaybin town, where counter-terror operations are still in progress. The terrorists were seen holding their hands up in surrender in the footage, issued a day after they were rounded up in a quarter where all buildings had been levelled during the operation. According to the footage, the terrorists left places they were hiding and surrendered in small groups after security forces encircled a troubled quarter in the ongoing “Hawk-7” campaign. At the end of the video footage, there is a photo showing a soldier distributing water, sandwiches, chocolate and fruit juice to terrorists who seemed to be exhausted and miserable. Reports said that terrorists, among them six women, were taken away from the operational area. At the end of the video footage, there is a photo showing a soldier distributing water, sandwiches, chocolate and fruit juice to terrorists who seemed to be exhausted and miserable. There has been no official statement from the terrorist organization on the mass surrender.